T-Mobile USA has launched the Nokia 5300 Xpress Music. 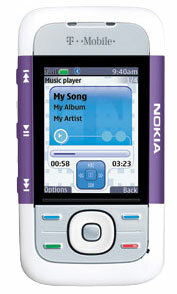 The 5300 is one of Nokia's latest music devices and is available exclusively from T-Mobile. Unlike Nokia's popular N-Series devices, the 5300 Xpress is designed for the mass market. It may be marketed as a music device, but it's also much more of a regular phone than Nokia's multimedia centric offerings. T-Mobile USA is selling the 5300 Xpress for $99 after a $50 mail-in rebate and 2-year service agreement. It's available in both Lilac and Black.